There must be a really high number of cannabis smokers out there who swear that White Widow is their all-time favourite. No surprise there, given White Widow’s excellent flavour and her outright spectacular potency and high. 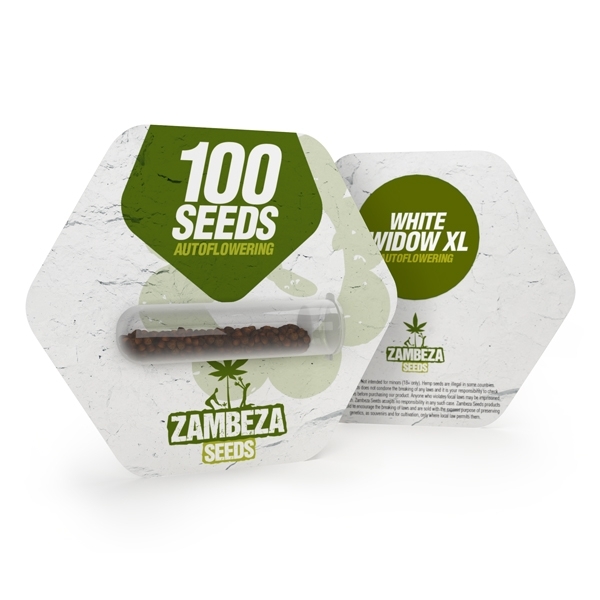 It just made sense to make an autoflowering variety of this classic strain but it wouldn’t be Zambeza if they didn’t also add several improvements with their Xl variant. They spent two years selecting only the best phenotypes to make this already fantastic strain even better. Out comes a truly outstanding autoflowering variety of White Widow that doesn’t need to hide from her feminized sister, with truly out-of-this-world yields and spectacular resin production. White Widow XL Auto grows in a reasonably short 70-85 days from seed to harvest where she’ll reward with a whopping 500g/m² of some fine WW bud, grown on a medium sized plant that can reach up to 110cm if you grow her indoors. Outdoors, she won’t get much taller and you can expect to harvest as much as 250g per plant. Just make sure that she gets enough sun. What makes White Widow XL also stand out is that she makes a very versatile smoke that delivers not just her trademark uplifting and euphoric high but this time also with some amazing relaxation. Because of this balanced effect and her relatively moderate THC content of 15% she is a great smoke that you can enjoy any time of the day or at night. White Widow XL Auto wouldn’t be a spectacularly good autoflower if her flavour wouldn’t be right up there as well. She tickles the palate with a complex blend of sweet, spicy and sour tones that will make you crave more of her with every hit. White Widow XL Auto may well be one of the best sativa hybrids that you can grow and she won’t let you down when it comes to her yields, flavour or high. 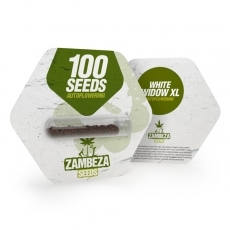 Even those growers who have little or no experience can now grow the famous White Widow easily with Zambeza’s White Widow XL Auto. White Widow XL Auto bulk seeds are available in packs of 100 seeds so you can stock up on this great and now improved Dutch classic!